For all the photos from this leg of the trip, click to view the Flickr album here. Its June 2014, I`m feeling a bit brain dead after a grueling year of OT school. Maybe a little trip to Europe is just want I need as a reward. Iceland is a small island and the most western point of Europe. The people are culturally very Scandinavian, but there are influences from the northern islands of the now UK (Orkney Islands I believe…). 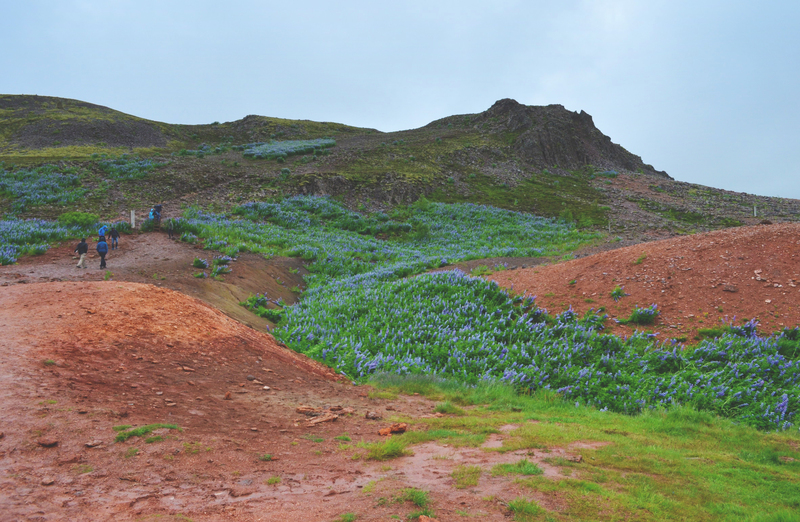 Much of the island is volcanic and immediately, you get a sense of the desolate, yet incredibly beautiful landscape. Iceland is also the home of the infamous Eyjafjallajokull volcano, whose eruption in 2010 stopped most air traffic in Europe. I truly believe if you can pronounce its name, you have become slightly more Icelandic. The flight from Toronto is about 5 hours. Same distance as to Vancouver. You land in Keflavik, a city close to the capital of Reykjavik, and take a (very clean and WiFi equipped) bus to the bus stop outside the city. 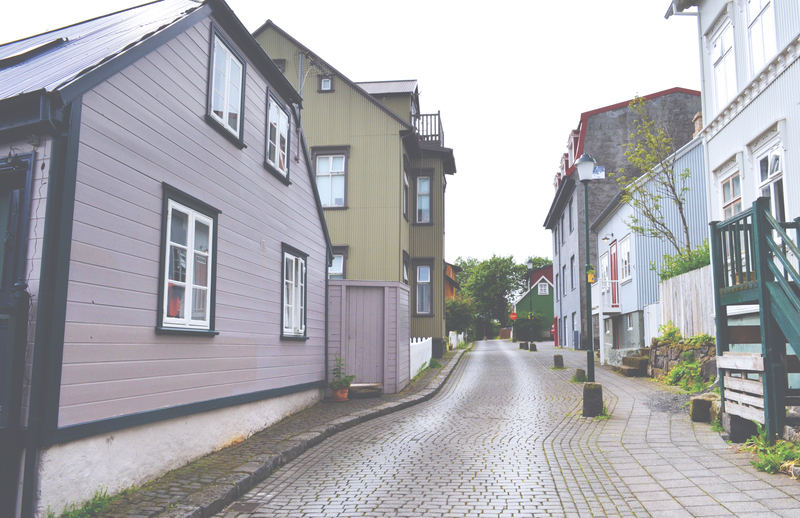 Downtown Reykjavik is filled with cool shops, bars, bakeries, and coffee shops. You could easily spend 5 days here exploring the different museums, churches, harbours, and restaurants and not really get bored. Here are a few of my favourites from this leg of the trip. The harbour is easily walkable from downtown. The shops are nice, but the striking thing for me were the massive ships that were being cleaned, repaired, or just put up for display. Absolutely massive and it really leaves you awestruck. This is also the place you can sign up to go for a whale watching expedition. The Sea Baron, or Saegreifinn, is popular for their soup and bread lunch. If you’re traveling on the cheap this is a nice place to stop for a light lunch. You can get full meals of seafood kebabs, which look great, but cost considerably more. If you’d like to try mink whale, it is available in kebab form here. It looks like a really dark red meat, almost the colour of red wine. Although there are obvious ecological considerations about eating whale. 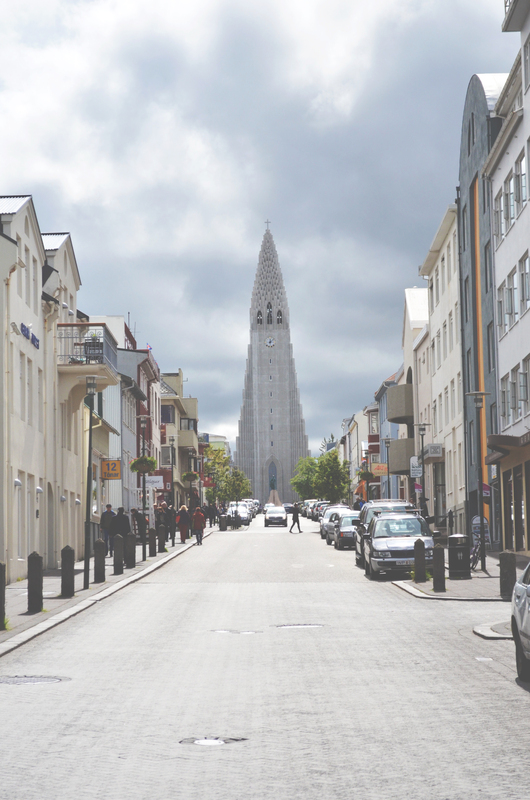 One of the shopping streets downtown with a clear view of Hallgrimskirkja, the behemoth church. Walking tours are a nice way to get a guide to the city. You can obviously go and read a book about it (boring af), but there are many options that aren’t expensive for walking tours of the city. My hostel had posters for tours led by a guy who majored in Icelandic history. His tour was really informative, fun, and he gave great tips about his favourite bars and sites in the city. Of course a tip at the end to help out a fellow struggling student is always welcome. Before I even got into hostel room, I booked a tour to see Iceland’s Golden Circle. 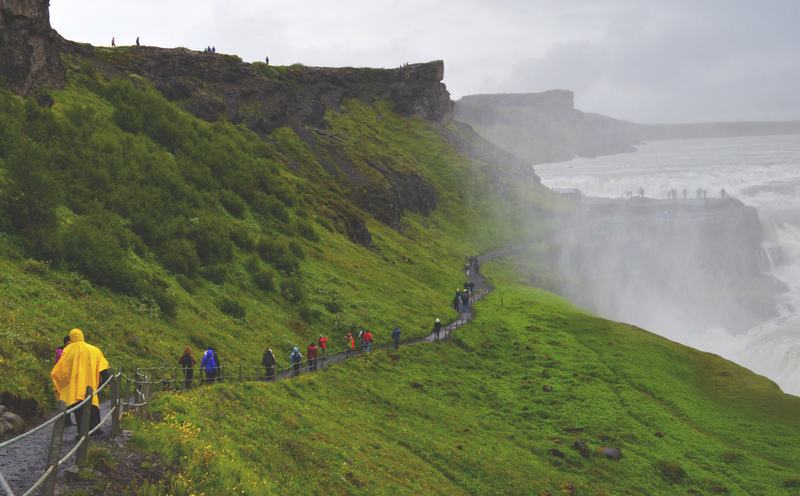 This refers to the popular tour people take to the 3 biggest sites around the city, including Gulfoss, Geysir, and Strokkur. Although the latter 2 were cool, something about the immensity of Gulfoss stuck with me. Huge waterfall with water raging past its cliffs, you really need a few minutes to take it all in. For more on these tours check the travel tips. Last I checked however, for the price of one tour you can rent a car and pay a little extra for GPS. If you’re going with a group, it might be better to just rent a car. 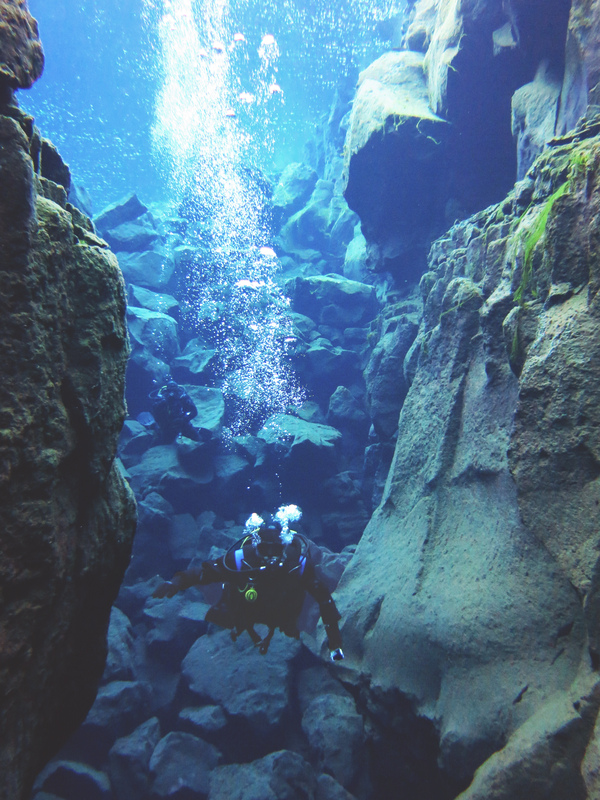 Diving between 2 tectonic plates at Silfra! Thingvellir its the home of Europe’s first parliament. The park is a bits drive away, or you can take a bus there. The park itself is beautiful and for around $12CAD a day, you can camp on the grounds. This campground is pretty sweet. Running hot water, washer and drying racks, even a covered picnic area for you to prepare your meals. I spent the summer solstice here (one day of non-stop daylight), and walked around for the better part of a day. I found the landscape, again, so different from anything I’ve seen before. A trip out here is definitely worth it. 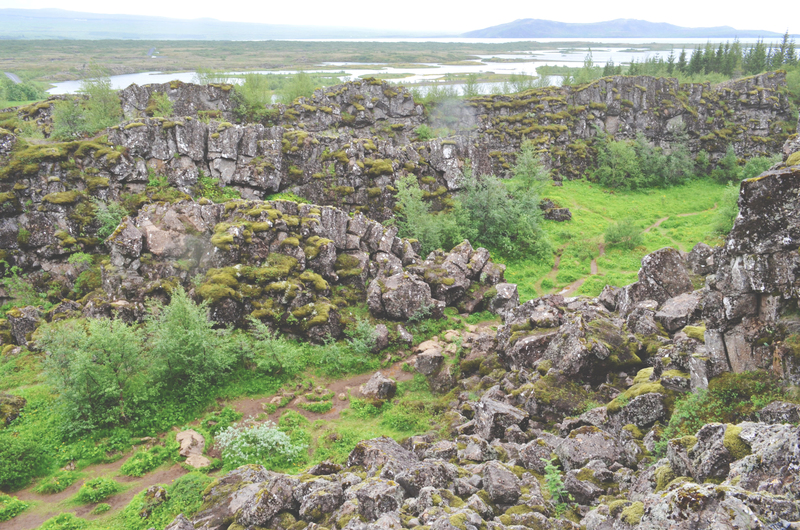 Also, if you’re into SCUBA, this is the home of Silfra, the dive site between 2 tectonic plates. Diving in Iceland isn’t cheap, or very warm (duhh). Dry suit diving takes getting used to, but the staff at the Dive.is really take care of you. At the time, it was just under $400 for 2 dives, including pickup, equipment, and snacks. You HAVE to remember, that even in the summer, it is cold. Water is about 2-4 degrees celcius. Your leggings under their insulation suit won’t cut it. I wore fleece running tights and 2 tops. I was freezing. My friend Andre couldn’t do his 2nd dive because he just wore thin long johns. I have to say that my favourite part of Reykjavik was just wandering around the city. 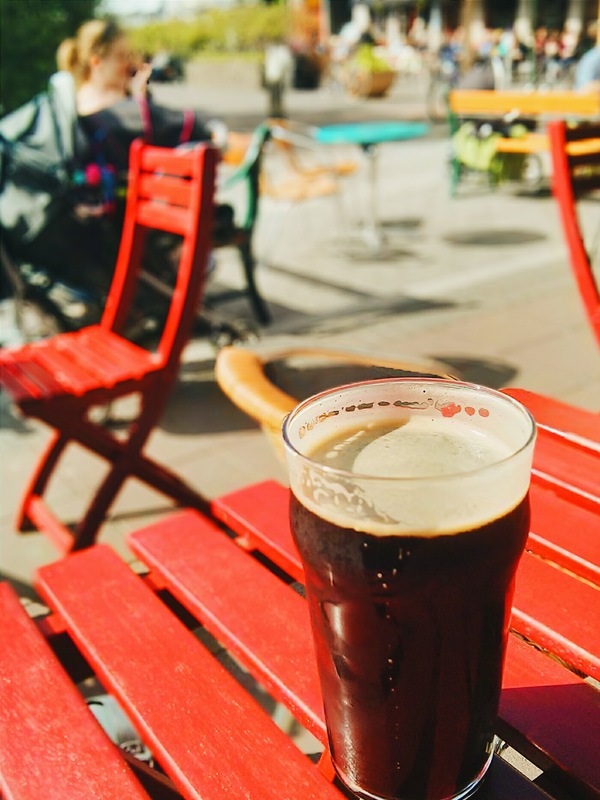 You stumble your way to cool coffee shops, artisan bakeries (cheapish breakfast) like the Sandholt Bakery, bar with live music (there’s one that has live jazz every Sunday night), and happy hours (I like Nora’s). Need to rest your feet? Go to one of their many book stores to read and have a coffee. If you’ve got dough, the outerwear companies like 66 North really nice stuff. Basically top of the line performance but designed with style in mind. And if you live in a cold place AND have dough to blow, one of the traditional Icelandic wool sweaters will definitely keep you warm 🙂 What you’ll notice everywhere you go, is that people are really friendly, and freakishly well dressed. If you go during the summer solstice, you’ll enjoy sunsets that go on for hours. It totally throws off your sense of time but you can’t deny how beautiful it makes the city look. I spent a lot of time in Reykjavik. I found the streets quaint, shops modern, food delicious albeit expensive at times, and the people are friendly and SO hip and fashionable. Seriously…but I also did a 6 day hike to Laugavegur, and a couple days in Snaefelsness. Keep an eye out for posts to come on those places! I flew to Iceland through Iceland Air, where each plane is named after one of Iceland’s volcanos. It’s a relatively unknown airline and have in recent years pushed to make a name for themselves in the transatlantic NA-Europe routes. FYI, flying with Iceland Air automatically gets you a free stopover up to 7 days on your way to the rest of Europe. This is enough for just a taste of this wonderful country. And also, Keflavik Airport has been rated the best airport in Europe, so you’re well taken care of from the moment you get on the plane, to the finals beers at the airport on the way back. Flybus is the company I used to get from Keflavik airport down to Reykjavik. Without too much traffic the ride is about 45 minutes long. You can buy tickets right at the airport, or ahead of time online. 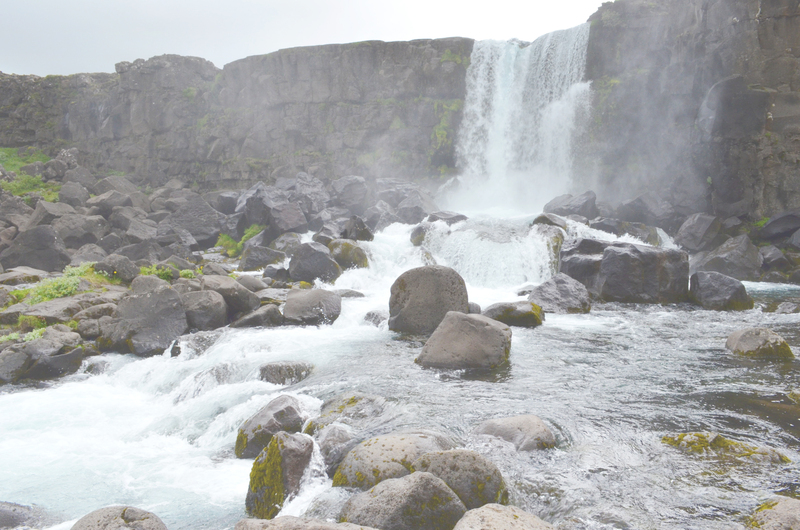 I’m not a huge fan of tours, but seriously for people traveling on a budget, Iceland is really expensive. Arranging transportation and all that on your own can, in some cases, cost more than it does than taking a tour. 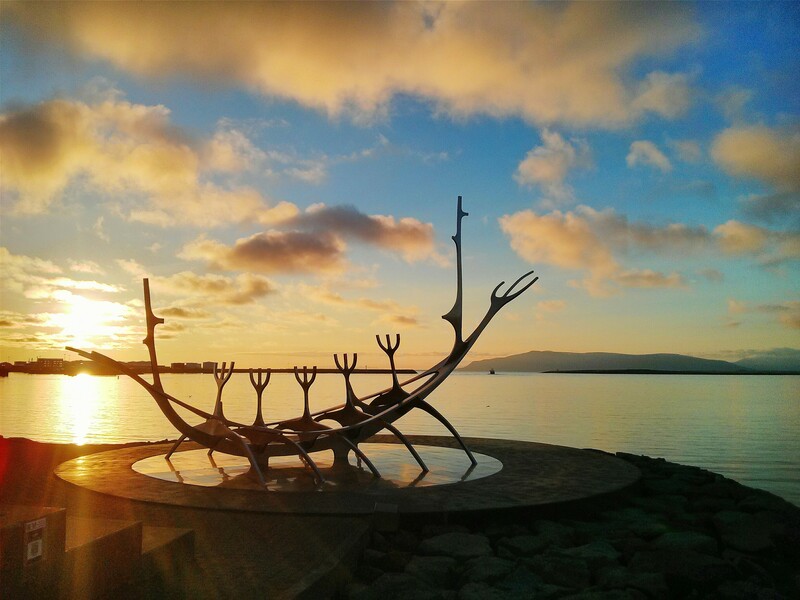 Reykjavik Excursions is the company I used for tours. Prices for most companies vary little, and the buses here are quite comfortable. If you’re here only for a few days (like for an extended stopover), this is a great company to do your tours. Blue Lagoon anyone? I really have to recommend Kex Hostel for your stay here. Relatively speaking for the solo traveler it isn’t expensive, and its a great place to meet people. The amenities are great (super hip), the bar has awesome music (even locals come down for the concerts), and the staff are extremely friendly. Like I said, Iceland is not cheap and you have to get creative to save. Take advantage of the hostel kitchen and make your own food. There are a number of grocery stores around that are yellow with a big pink pig called Bonus. You can buy your snacks, deli meats, and breads here to save tons on meals. Skyr, an Icelandic yogurt (technically a cheese) is like Greek yogurt on steroids. Its a great way to replace meals as a serving has about 18g of protein. Being the first real “expensive” country I’ve visited, it was weird and off putting to have to make all my meals. Besides you don’t want to come all the way here to eat ramen noodles. Lunch is a great way to get all that restaurants have to offer, but at a lower price. Special mention to SNAPS! whose rotating lunch special is under $20. Delicious way to try the seafood here. Happy hour is also abundant. It’s a model that I’ve noticed many Vancouver establishments adopting. Coffee shop during the day, hip bar at night, and good times alll day. Anyway, keep an eye out for happy hour cuz its your best bet for a cheap pint. Note that the relatively warm months of July and August are the most popular times for people to visit. Prepare for crowds and hiked up prices for just about everything. The advantage of coming then is the relatively stable, mild weather. June and September are shoulder seasons, with generally OK weather, but substantially fewer crowds. You get the long days characteristic of northern countries which is nice. Winter is chilly (down to -20 is considered very cold), and dark as you may only get a few hours of sunlight if at all. However, prices drop significantly from everything from flights and hotels, to tours. A quick comparison: My sister did the tour to the Blue Lagoon off season for around $45CAD, while prices had jumped to $90CAD when I was there. However, there are some things that are better in the winter, notably catching the Northern Lights, and visiting ice caves.